How has HG impacted your life? Honestly, it’s the worst thing I’ve ever known. I was totally unprepared for it in my first pregnancy, and I had incompetent doctors who blamed me and refused to provide necessary treatment. I lost faith in medical professionals, family, and friends. A lot of abandonment can go on with HG, because people don’t understand it, it’s unpleasant, and it’s prolonged (which makes it medically expensive). I felt very isolated, because I had never heard of HG nor did anyone else I knew; I felt very different. Sadly, the first pregnancy ended in a second trimester abortion. I tried to hang in there, but when I started having visual and auditory hallucinations I snapped. Destroying a child I loved and wanted was, like HG, outside the scope of usual human experience, and I sustained permanent physical and emotional damage from that. I’ve had 4 pregnancies and HG in all of them. At my worst I vomited every 8 minutes, over 40 times a day. HG definitely limited the number of children we were able to have, and there was a period of years when it was really emotionally difficult to be in a culture surrounded by healthy, happy pregnant women. It was stunning and heartbreaking to exist in a normal world that I somehow couldn’t be a part of. But it’s not all negative. What did HG teach you? HG has taught me to be more helpful and compassionate to others who are suffering. In the same way that people did not understand what I was going through, I don’t always understand what others are going through. They say stupid things, I say stupid things. No one is perfect. It was humbling and taught me some grace. The devastation of HG burned away a lot of the garbage in my life and grew me. It brought me closer to God in a way I don’t think I ever could have been without it. It also remains as my baseline for suffering. Three years ago I had surgery to remove my spleen and part of my pancreas. Recovery was rough and would have been a lot more depressing if I didn’t know what real suffering was like. When I got down, I’d think, “Well, at least it’s not HG.” Compared to HG it was cake with fluffy marshmallow bunnies on top. No matter how low my lows have gotten in life, HG is lower. Everything seems uphill after HG. Have you participated in the UCLA research? Absolutely! Though it can be tough to revisit the trauma of HG, the UCLA research is a TREMENDOUS opportunity for HG sufferers to make a difference for the future. It’s an opportunity to be heard and to provide evidence that will show our disease to be biological in nature and not emotional or psychological as some have incorrectly assumed. It’s so exciting to think that this research could save lives in the future. Imagine a world where women could be identified as high risk for developing HG! Removing the sucker-punch factor could help women to prepare! It could change the way we select doctors and even mates. It could change the important choices we make in life and even how we see ourselves. It was such an incredible privilege to participate in HER’s UCLA research. I cannot emphasize enough how important it is and how easy it is to affect a world of positive change just by answering a few worthwhile questions and spitting in a cup. When it comes to HG, I wish everyone would give a spit! If you could describe HG in one sentence how would you describe it? Quite frankly, HG is an alienating, isolating torture unlike any other I’ve ever known. What do you say to those in the medical community who still think HG is a psychological issue? I say do your research. Though this is a relatively rare disease the negative impact on lives is grossly underestimated. If you are treating your patients from the viewpoint that HG possesses a psychosomatic etiology, you are not living up to your own awesome potential, and you are doing a vast disservice to your patients who deserve much better from you. You didn’t work so hard in medical school so you could fail here. While HG is a tenacious, pesky disease to manage, it is still easy to treat the sufferer with the dignity she deserves; don’t kick her while she’s down or treat such a dramatically bad disease passively. Realize that people who are enduring severe, prolonged debilitation will often present with depression. Understand that it’s the depression, not the HG, that is transient. The depression will abate with symptom alleviation, not the other way around. Treat your patient as you would want to be treated were it you instead of her. Did the HER Foundation help you during your pregnancies? Unfortunately the HER Foundation didn’t exist when I had my first three pregnancies, and by the fourth, I had spent nearly a decade researching HG. I was writing Beyond Morning Sickness: Battling Hyperemesis Gravidarum, so I felt somewhat a pro! But honestly, if the HER Foundation had been around in that first pregnancy, I’m fairly certain it wouldn’t have ended the way it did, and my whole life would be totally different. The HER Foundation has a lot of information on HG and a physician referral list. 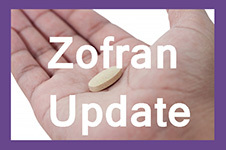 There are amazing research opportunities and very importantly, message boards where sufferers can connect and help each other. To have known I wasn’t the only one, to have had an advocate and the knowledge of how HG can and should be treated–it would have been a huge game changer. But I have to say that the HER Foundation has helped me tremendously in supporting the dissemination of Beyond Morning Sickness and the children’s picture book: Mama Has Hyperemesis Gravidarum…But Only For A While. It is terribly difficult to publicize books on HG, because the population of sufferers is relatively small, but the HER Foundation really wants to provide others with as many educational and informational resources as possible. Knowledge is power! The forums have been great for me also, because as just about everyone knows, HG is so traumatic that it can still affect us emotionally after it’s over. I learn a lot from what other moms are going through: everything from insurance issues to new medications. Also, a lot of their volunteers help people who write to me at beyondmorningsickness.com and who are in HG crisis. You don’t have to be pregnant to benefit from the HER Foundation’s website or to connect with and serve others who are pregnant and suffering! Are you excited about the new genome research project that just started at UCLA? So incredibly excited and grateful! No one else is doing this! The HER Foundation really cares and is doing everything in its power to make a difference. If there was one thing you would tell a current HG mom, what would it be? HG is so shockingly debilitating and without respite that there are times when it seems the sufferer just cannot possibly go on like that for one more minute, much less one more day (or several more months). The prevailing message I want to convey is that you are not alone, and taking it one second at a time, YOU CAN DO IT. You CAN get through this. You CAN beat HG! There are resources like the HER Foundation and Beyond Morning Sickness. We are in your corner rooting for you, advocating for you, providing information for you and your loved ones, and cheering you on. Go, fight, WIN! What were some of the most memorable things that were said to you during HG that upset you and stay in your mind? There were so many; where do I start! Seriously, I got some horrendous comments from friends, family, coworkers–just about everyone! But I think I was most dumbfounded by comments from those within the medical profession who I felt should have known better. I was told by one of my first doctors that the reason she didn’t admit me to the hospital was that the hospital is not a hotel and that I would only disturb people with real diseases who wanted their children. In my fourth pregnancy I had 4 PICC lines and was in the hospital for over a month,and the dietitian asked me, “Have you tried eating a sandwich?” In the same pregnancy I got a staph infection from PICC #3, had a fever of 103, was vomiting blood,and simultaneously eliminating on myself when the disgusted nurse informed me, “Ashli, Ashli, Ashli…pregnancy is a normal part of life!” I asked her if she thought I was doing this to myself. She replied, “I didn’t say that. I just think you’re getting yourself all worked up.” I had a weekend gastroenterologist who, basically told me I needed to “cut it out” (HG) because “PICCs are dangerous.” The list goes on and on. Your books have helped numerous women around the world, will you be writing more? Well, now I’m thinking of writing a ten-volume series called Horrendous Things People Say to HG Sufferers! Just kidding! It has been so humbling to have the worst thing in my life turn into something that can serve others: the first ever comprehensive help and information book on HG. Since 2007 Beyond Morning Sickness has served others from all 50 states and 23 countries. The response has been overwhelming; there is definitely a need for HG literature. I was really surprised to find that the audience for the book was broader than first anticipated. I’ve heard from grandmothers who, for the first time, read about their disease after suffering through a “nameless” pregnancy ailment decades ago. They’ve expressed a release of shame and guilt that was conferred to them by others who blamed them for being physically or mentally weak. Others’ suggestions and the lack of information combined to become a damaging part of their self-actualization, which is really heartbreaking if you think about it. To be able to help grandmothers correct some negative, false assumptions they held about themselves for years was a gratifying surprise, and I am really grateful. I never had a clue that this could be a component of the purpose for Beyond Morning Sickness. It reminds me of the HER Foundation research opportunities: we never know all the phenomenal ways in which one simple act of participation can really help others. There are so many ways people respond to the HG experience, and there is so much to talk about. For whatever reason the HG Diary of my 4th pregnancy resonated with people, so I decided to publish it. 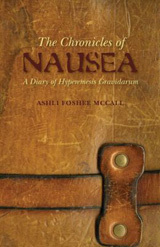 The Chronicles of Nausea: A Diary of Hyperemesis Gravidarum is now available. I added lots of pictures of the outcome of the pregnancy, because one of my goals is to help moms keep their eye on the prize. When you’re in agony and so far away from relief, the light at the end of the tunnel can feel like an oncoming train. But in the end, it’s all worth it, and the end will come in time. The Chronicles of Nausea serves as a compact illustration of this. After this book I’ve got one more up my sleeve. I receive a lot of letters from Christians asking why and where God is in all of this. HG can be a real faith challenger, especially if loss compounds the issue. People are really surprised to learn that God has a LOT to say about HG. As a follower of Christ myself I really want to write that book! But if not me, someone else has to write it. God is not silent on the topic of HG. This entry was posted in Mom Stories, New Products by annmarie. Bookmark the permalink.